I love you, and you shouldn't have to pay for a meal in this town for the rest of your life if I have anything to do with it. You were the reason we made it to the promised land last year, and I will never forget that. But how shall I say this gently? You, ahem, are not performing up to your previous high standards, and you are making me age prematurely with your 9th inning behavior. Visions of Mitch Williams are dancing in my head, and not in a good way. I hope you wouldn't mind just sitting in the bullpen and not coming into any more games, please. Thank you! Sleeves have always been my nemesis. 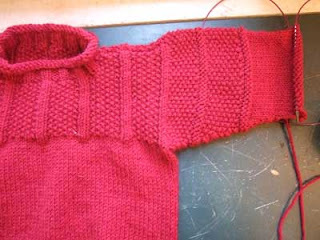 Top down, cuff up, back and forth, in the round, picked up or knit separately - it just doesn't matter. I don't like doing them. And when I finally finish this sleeve.....I have to do it all over again on the other side. I was going to parcel all these out so I'd have a lot of post material and so that you, dear reader, would not be bludgeoned with endless finished knitting project pictures. But now they're so, you know, last month, that I just want to post them and move on. Vermont O-Wool pattern, Lamb's Pride Superwash. Very easy pattern, very enjoyable. 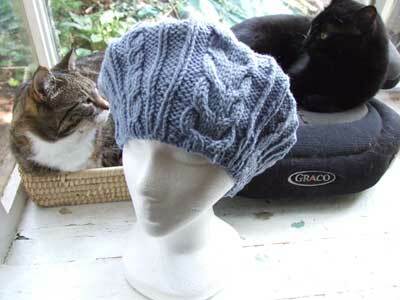 Cabled hat, Vermont O-Wool. 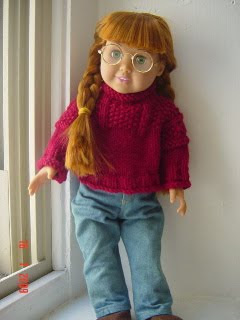 I'd tell you the designer, but she sent me such a flurry of rude, suspicious emails after I bought this pattern that I don't particularly feel like giving her any publicity. I'm all for protecting copyrights, for God's sake, but there's no need for the level of insulting discourse that this woman laid on me. It's a nice pattern, but I didn't particularly like the ungraceful giant horseshoe cable and how it didn't really decrease beautifully at the top. Now this hat I loved! 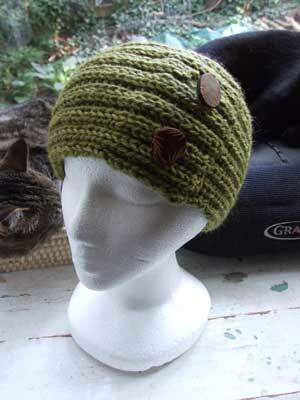 Three Gauge Beret by Nancy Lindberg, Berroco Cuzco. 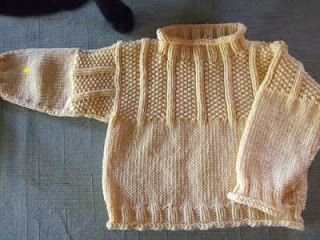 Really great pattern, gorgeous yarn. The pattern called for 135 yards, and I had 130 in the Cuzco. 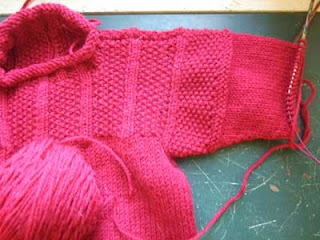 Now when I write a pattern, I'm very generous with yardage estimates because I don't want people to run out of yarn. But when Nancy Lindberg says you need 135 yards she means it. 130 yards got me thisclose to the end. Now I have to track down another ding-dang ball of Cuzco. 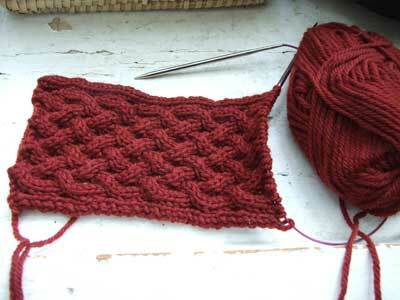 This is the beginning of Vermont O-Wool Lattice Braid Hat in Mission Falls Wool. I lurve how it looks but you have to cable across every right side row, which is extremely labor-intensive and not very fun. 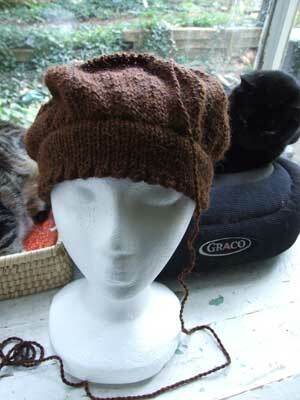 I'll finish it eventually because I think it'll make a smashing hat, but I have more fun stuff to knit right now. This pretty thing is Multnomah by Kate Flagg. 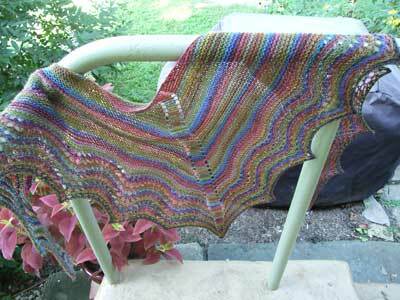 The yarn, which I was ambivalent about all the way through this project, is Kaffe Fassett's Regia sock yarn. It looked weird and uber-stripey while I was knitting it, but I had it in the stash and I didn't feel like making socks with it, so I thought I'd try it. I was unsure about the result until I blocked it. And then I was IN LOVE. It turned out really beautiful, I think. The end. No, I didn't invent a new knitting machine that does all the work for you. I figured out how to embed a YouTube video! I'm all 21st-century now, yo! Okay, school started reallllly late this year. Gus's protests about getting up early and how boring school is rang hollow; I think even he was glad to get back. But of course, now I am home after dropping him off, and the house is really quiet, and even the bowl of Lucky Charms that I treated myself to cannot keep me from being sad. It is my annual Goofy Mom Sad Day. Why are all the other moms happy to have their kids off to school?? I love having Gus here. Of course, now let's admit it, I also love sleeping late and not making lunches at 6:45 am, so there is that as well. But I'm sad. Waaaaaaaaahhhhhh....... So cute. First day of kindergarten. 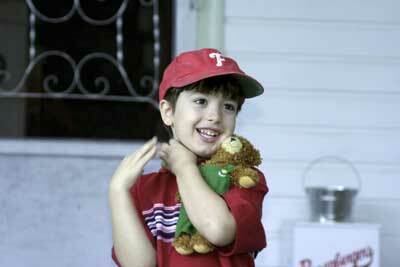 I was going to subject you to a whole cavalcade of first day of school pictures, but I'll go easy on you. Today's picture is still on Matthew's camera, but maybe I'll post that later. Gus and I had decided that it was time to give his room a makeover (it's been the same since he was 18 months old, so yeah, it's time), so I got to visit my best friends at Lewis Paint after dropping Gus off and picked out some quarts of paint to try out. Nothing soothes me like a big painting project! Now let's see, it's 9:30 - only 5 and a half hours till I pick Gus up again! Yippeee! Okay, this is kind of a nonsense post, just to make me start posting again! What happened? Well, nothing exciting - I've just been puttering and sort of kind of getting ready for the school year to start. Gus goes back to school tomorrow. That's a lonnnnnnggggggg summer vacation! It's practically October! Anyway, I am all set to start posting again, so please check in every single moment that you can! !